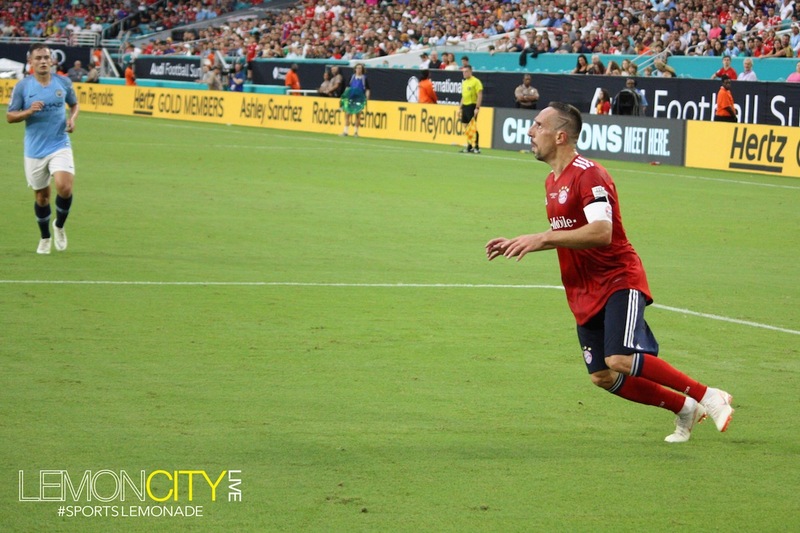 Miami, FL – A humid and wet summer evening in Miami could not stop 29,195 fans from filling the lower bowl of Hard Rock Stadium to enjoy the beautiful game. 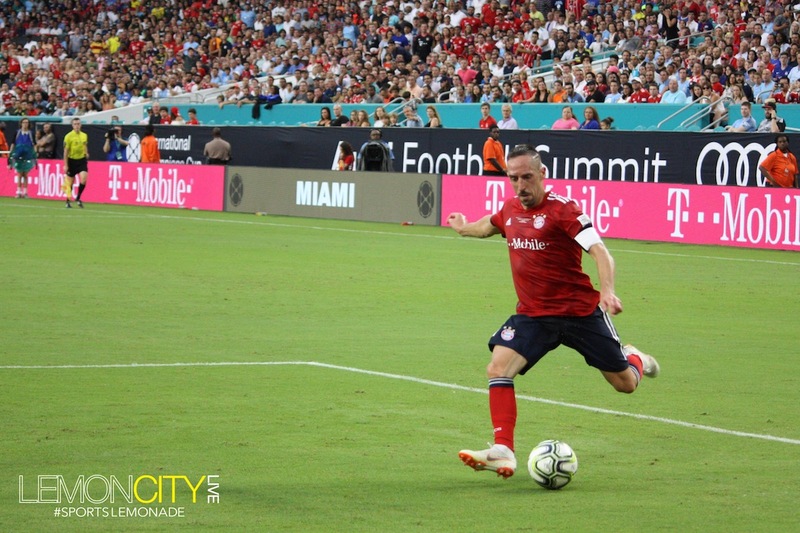 The International Champions Cup, now in its sixth year, came to town and brought with it a couple of European soccer powerhouses. 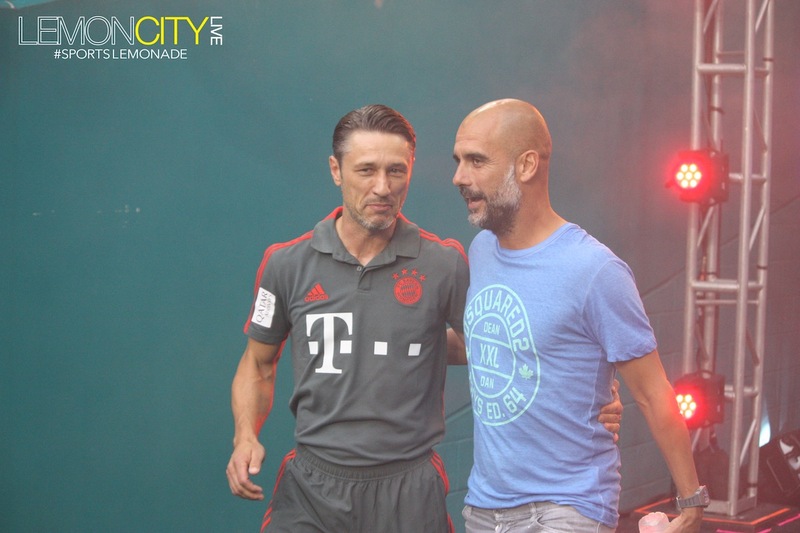 Defending Bundesliga champion, FC Bayern Munich took on English Premier League champions, Manchester City FC. To be fair, both teams were missing some big notable names from their rosters. More than two dozen players were missing from the two teams due to post-World Cup vacation and injuries. On paper, both teams were still loaded with stars. They were also loaded with very young talent. Man City’s starting lineup had four teenagers and a 20-year-old starting alongside new record club signing Riyad Mahrez. The Algerian joined the Premier League champs in May after Leicester City agreed to a $78 million dollar transfer fee. 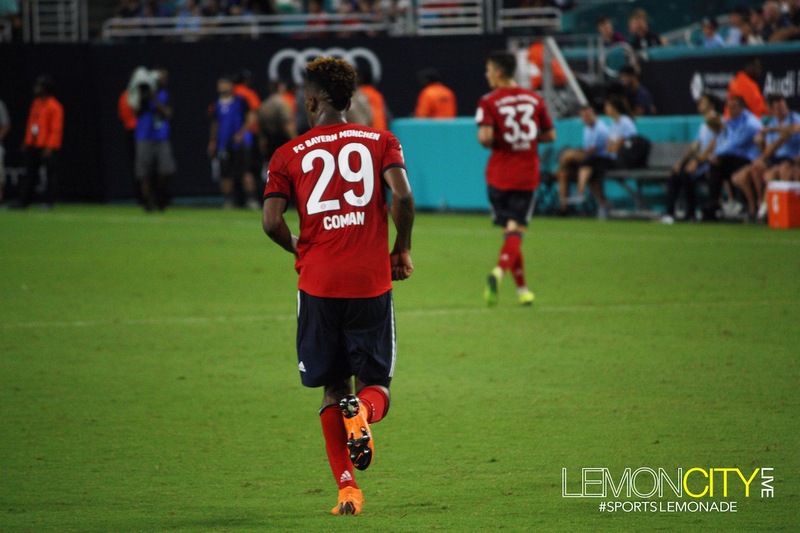 The German squad fielded the likes of Arjen Robben, Franck Ribery, David Alaba, and Kingsley Coman. One big notable absence, that surely would’ve spiked attendance even more, was James Rodriguez. 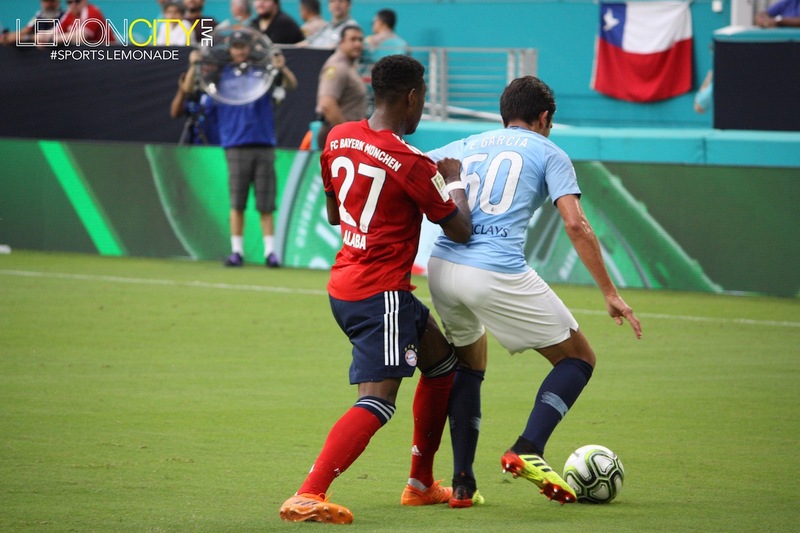 At Friday’s press conference, FC Bayern Head Coach Niko Kovac confirmed that the Colombian star would not be in uniform but would be arriving from vacation in time for the mandatory sponsored festivities. If you ask me, the attendance would’ve easily jumped well into the 40k range had this not been a World Cup year. Festivities aside, the game was actually very competitive. Both squads kept most of their stars in for the duration of the game. But, this game was mostly about youth and a look into the future stars of the sport. The action started early in the first half. 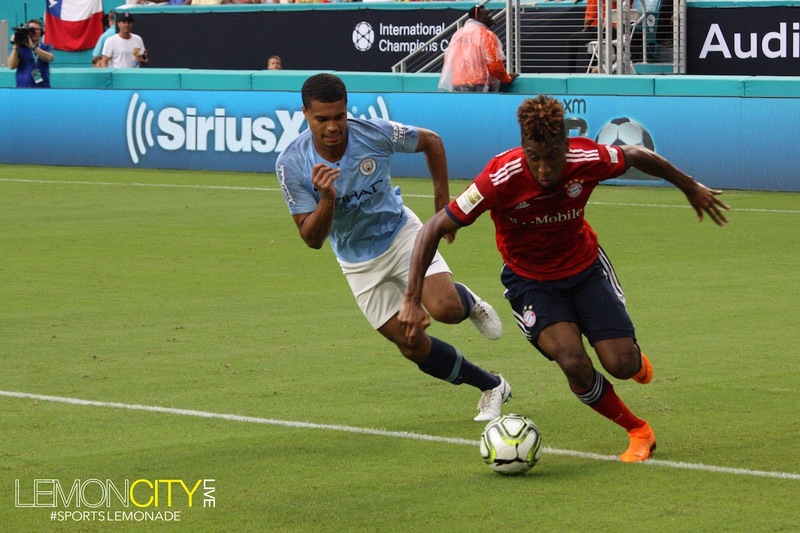 Manchester City came out aggressive to start the game, creating a few good chances and moving the ball around the pitch nicely with all the youngsters. 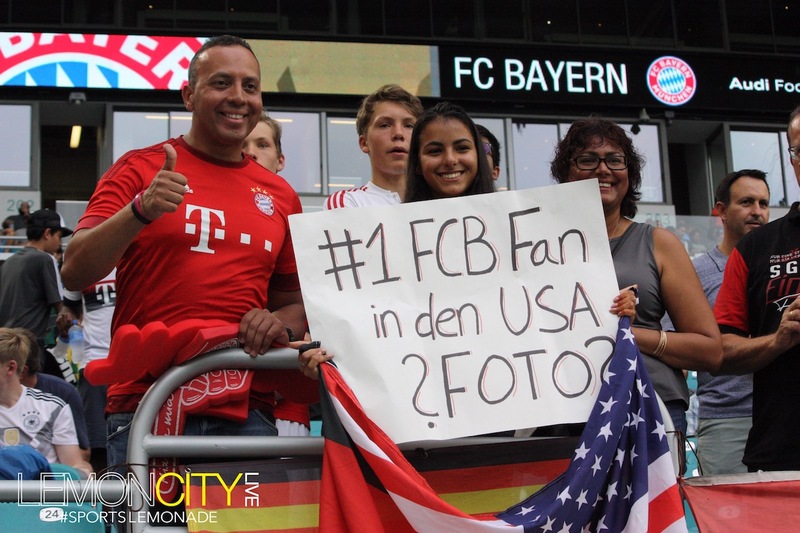 However, it was Bayern who got on the board first in the 15th minute. 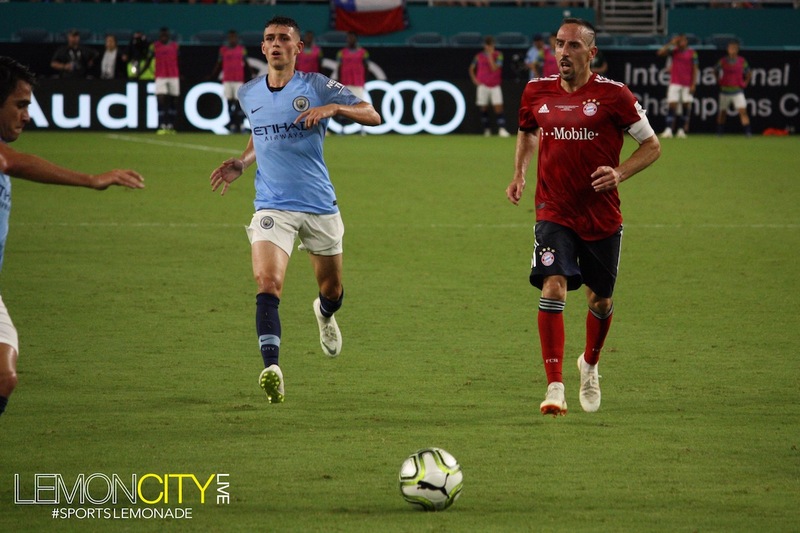 Rafinha quickly broke down the right flank and delivered a cross into the penalty area for 19-year-old, Meritan Shabani to head past experienced City goalkeeper, Claudio Bravo. Not bad for the kid. It didn’t take long for Bayern to double their lead. 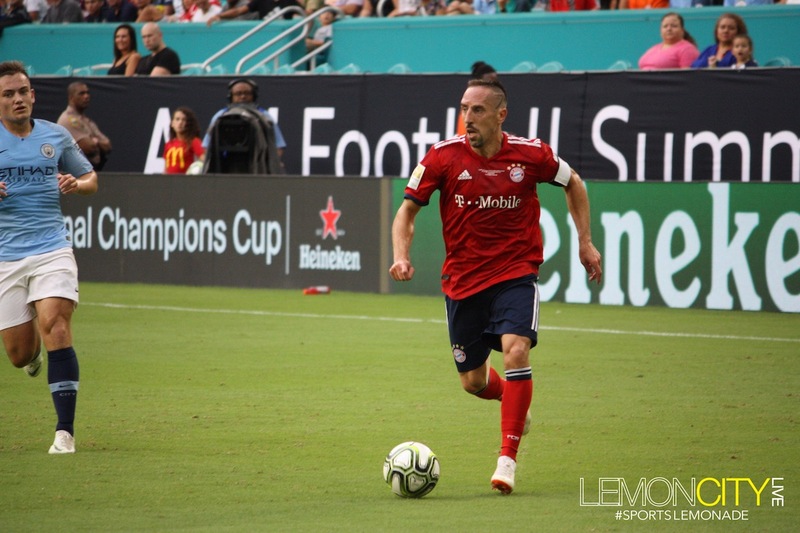 In the 24th minute, Ribery spots Robben flying down the right wing and breaking towards the middle of the defense. 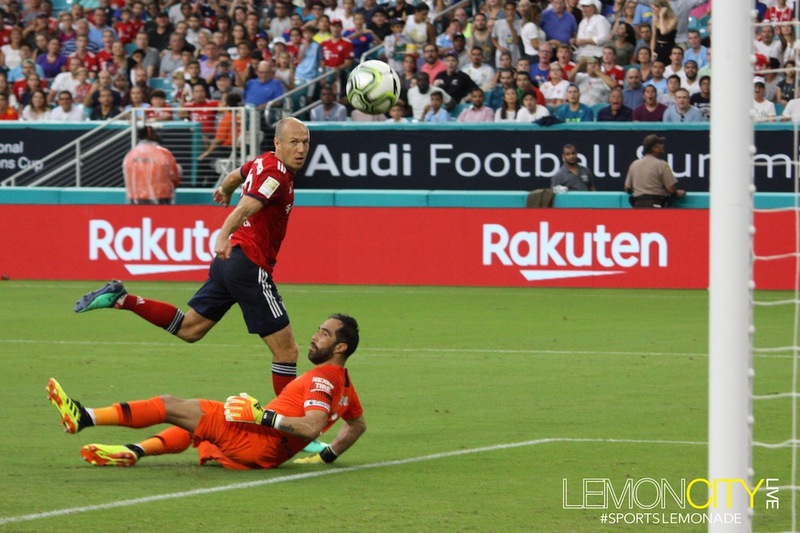 The seasoned French veteran places a perfect dime of a pass to an in-stride Robben, who slides past the defense and chips it in over a diving Bravo. 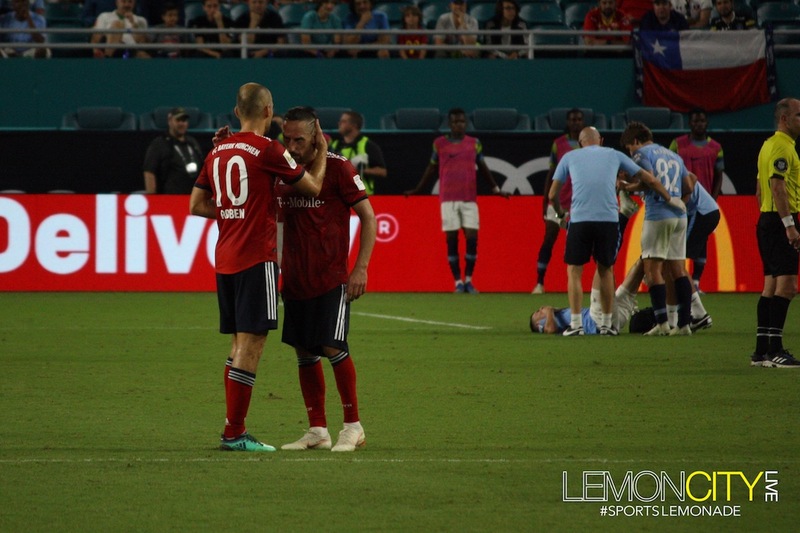 Such class and finish from the pair of Bayern stars. It looked like this was going to be a breeze for the more experienced German side. Then, it got worse for City. 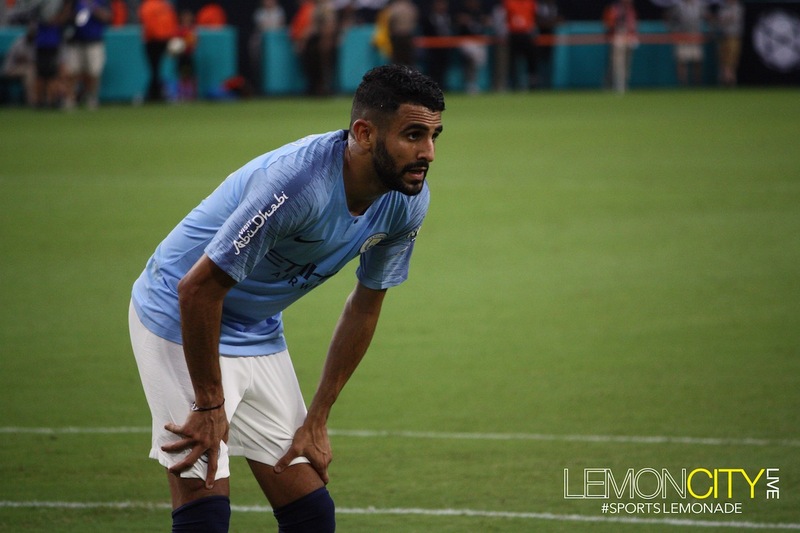 Early in the game, Mahrez, the Algerian winger had appeared to hurt his ankle in a challenge from United States defender, Chris Richards in the fourth minute. 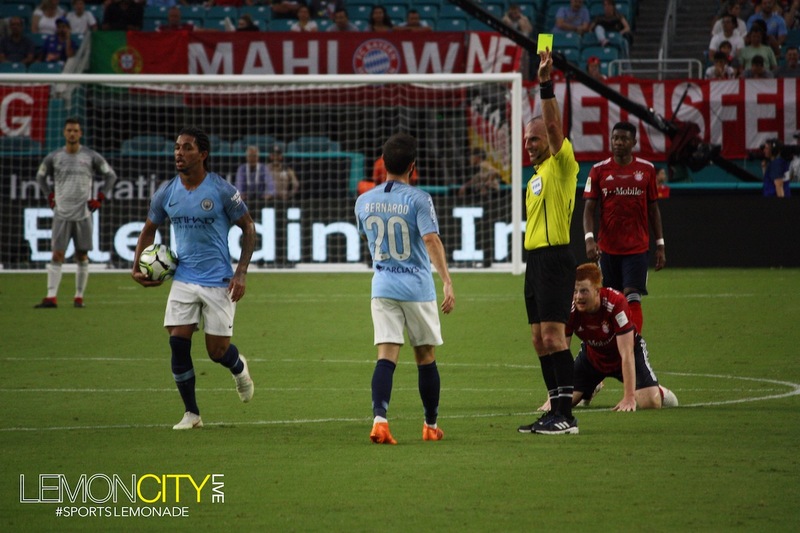 He received treatment, but went down again midway through the half without anyone near him, and then he was replaced by Bernardo Silva in the 26th minute. 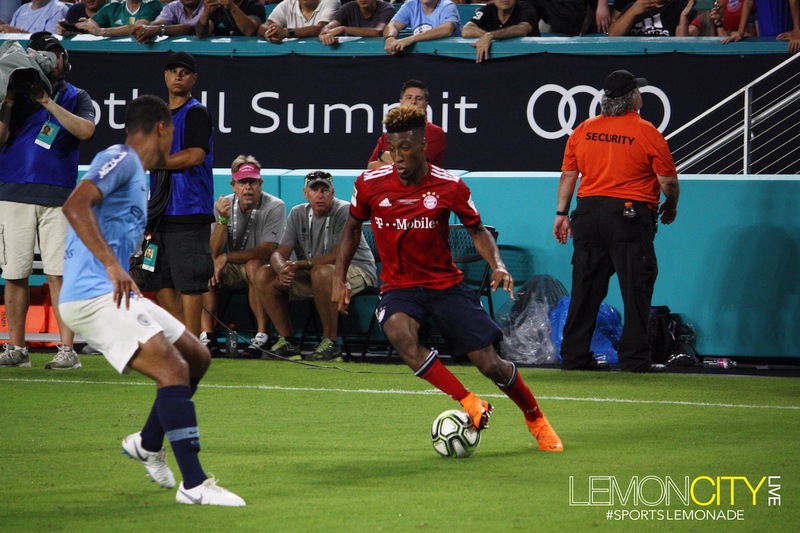 Right before the end of the first half, Silva proved to be vital with a neat run and finish into the corner that cut the lead in half going into the break. 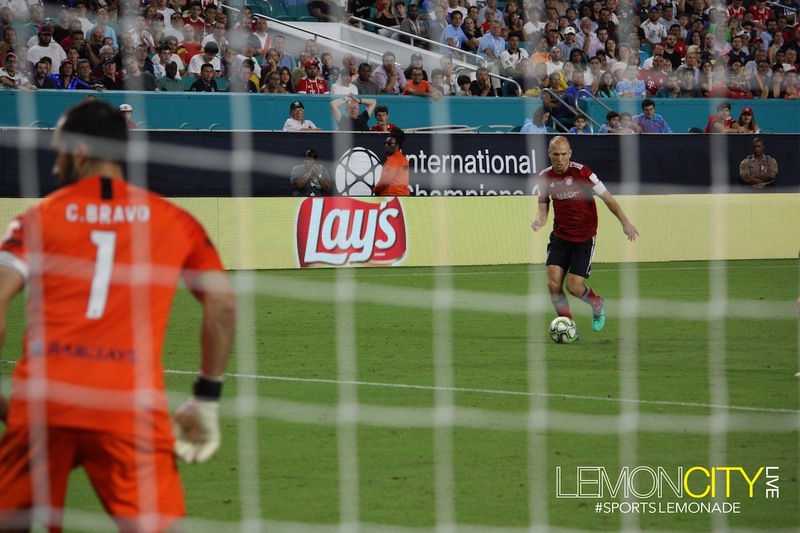 City wasted no time coming out aggressive to start the second half. Capitalizing with a 51st-minute goal by the 19-year-old Lukas Nmecha. Silva would get his brace on the night in the 70th minute to complete the comeback and take the lead. 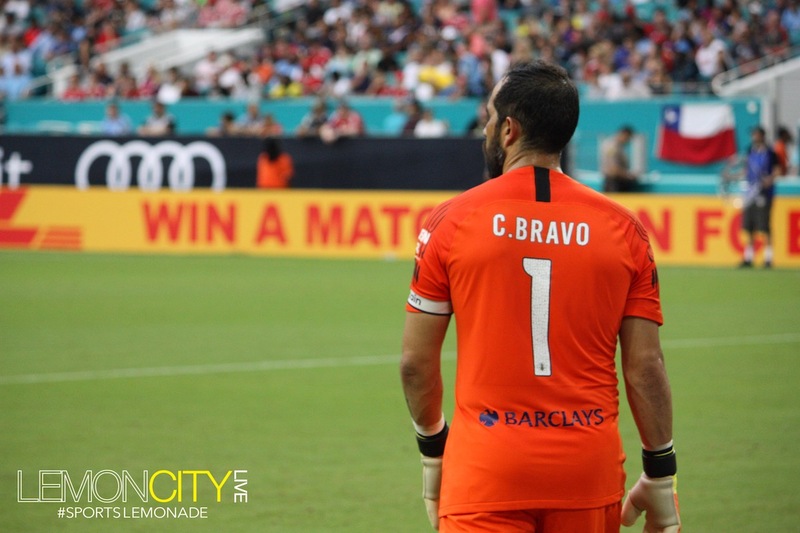 Bayern would try and equalize through the very last minute of the game, but City goalie Claudio Bravo was just too strong. City would hold on to the 3-2 victory. 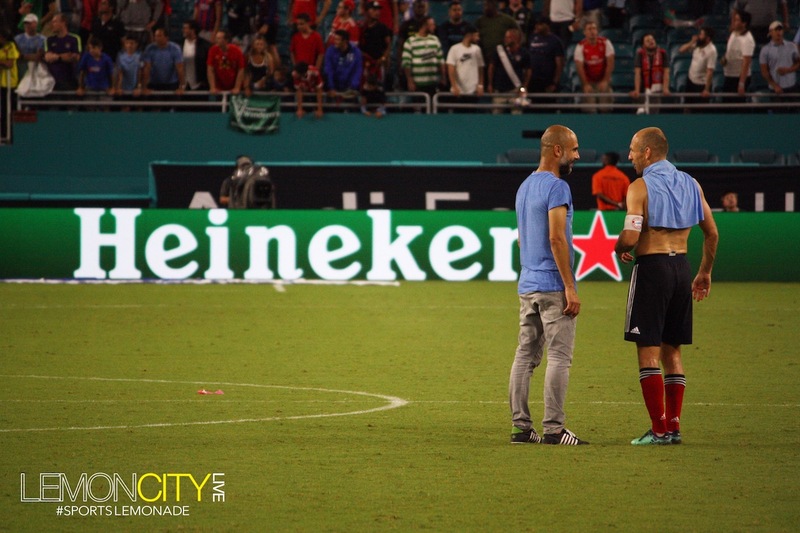 After the game, Pep Guardiola was very impressed with his team’s performance and perseverance after going down early. Manchester City now heads back to England to get ready to take on Chelsea for the Community Shield on August 5th. 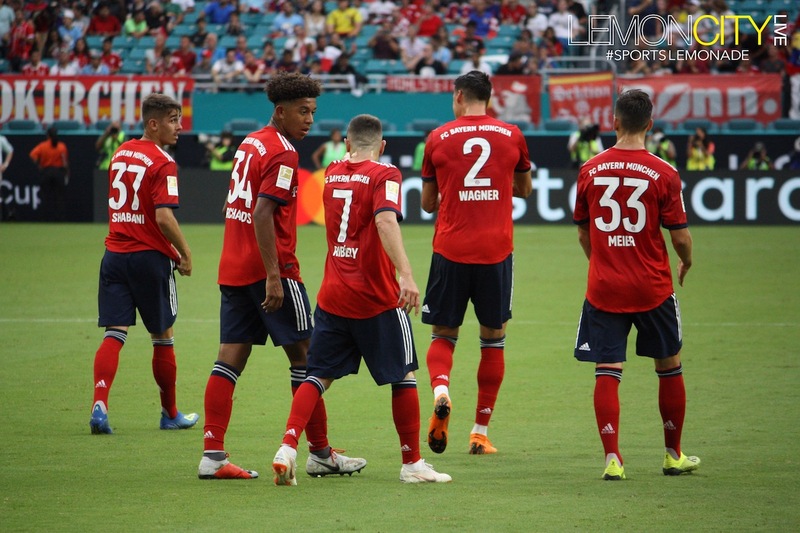 Bayern heads home now to get ready for their DFL-Supercup match against Eintracht Frankfurt on Sunday, August 12th. ICC 2018 concludes in Miami on Tuesday when Real Madrid take on Manchester United at 7pm at Hard Rock Stadium.